Butterflies love cosmos in the fall. 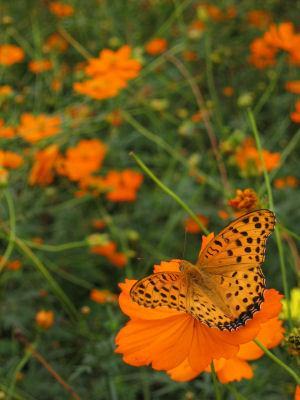 Most people think of summer as the ideal time for butterfly gardening, but there are many fall butterfly flowers as well. It's important to plant fall flowers for the butterflies because they need energy for their long migration to their winter grounds. Many different species of butterflies migrate in the fall so that they can spend their winter in a warmer climate. Perhaps the most famous of these is the monarch butterfly, which travels thousands of miles to winter in Mexico or California. These butterflies have the longest and most unusual migration pattern, because they migrate both spring and fall, rather than following the food supply like many other butterflies do. Monarchs and other butterflies need a good supply of food in the form of nectar before their journey and along the way to fuel their long trip. That's why it's such a wonderful idea to remember the butterflies in the fall by making sure you have something in the garden that they can eat as they pass by. There is a wide variety of fall butterfly flowers available that will grow in all areas of the country. Many fall flowers last until the first frost or even later, providing ample opportunities for your fluttering friends to feed. Asters are a great choice for butterflies, particularly the New England aster which has orange-centered purple flowers and can grow up to six feet high. These flowers appreciate regular watering. Goldenrod is a wonderful plant that is good for butterflies and comes in many different varieties. Seaside goldenrod is a good choice for people who live near coastlines, but any variety is great in a sunny location. Joe-Pye weed is another good choice for an easy growing butterfly flower. This plant also likes consistent water, well-drained soil and full sun. They will reward you with tall plants and masses of small purple flowers that also attract bees. Check with a local garden supply store to see what fall-blooming flowers will do well in your area. Keeping the butterflies in your yard as long as possible is a great way to extend the season and put off thinking about the cold weather that is sure to follow soon. If you try to attract butterflies to part of your garden throughout the year, you should take special care in that part of the garden when doing your fall clean-up chores. Just because it looks like all the butterflies have gone away does not mean there aren't larvae or chrysalises hanging out some place you can't see. Resist the urge to clean up this part of the garden because you might be disrupting or even killing the next generation of butterflies that will grace your garden next year. Another thing you might want to do in addition to planting fall butterfly flowers is leaving some apples on the ground in your garden. Rotting apples provide minerals and amino acids that some butterflies can use. Remember, also, that it's a good idea to garden organically when planning a butterfly garden, as butterflies are particularly sensitive to chemicals. When planning your butterfly garden for the fall, remember all the things that made it successful in the spring and summer: a variety of blooms, some shallow puddles for water to collect in, and a nearby place for you to watch the butterflies from.